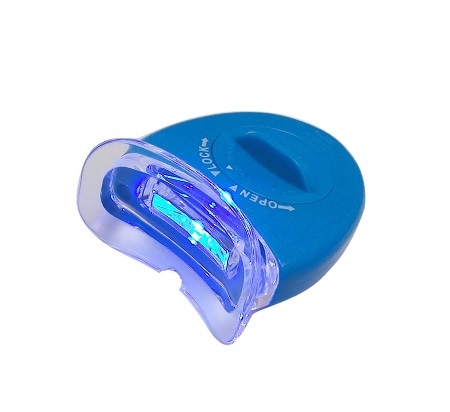 This best-selling LED teeth-whitening accelerating light gives a boost to brighten your smile. Specifically shaped and created for uniform whitening, this LED light activates whitening gel and helps accelerate the whitening process. The Accelerating light activates the teeth whitening gel to remove surface stains and penetrates deep to remove embedded residue. Step 1) Open hatch on the back of LED Accelerator light (opposite side of the white button). Take out the two batteries. You should see a transparent plastic tab. Remove this plastic tab to allow the batteries to make contact. Once the tab is removed, put the batteries back and close the hatch. Press the white button to turn the light on. If the blue light is not on, you may have inserted the batteries incorrectly. Step 2) Gently clean/wash the transparent mouthpiece of Accelerator Light (with the light turned off). Do not submerge the Accelerator Light completely under water. Step 3) Once you’ve painted on teeth whitening gels, applied your strips or put on your dental tray with whitening gels, place the Accelerator Light against your teeth or the dental tray and wrap your lips around the outer rim to hold it in place. Step 4) Turn on the light. Step 5) Keep Accelerator Light on and in your mouth for the duration of teeth whitening session. Step 6) Turn off the light. Clean/wash the mouthpiece and store in a dry & safe place.